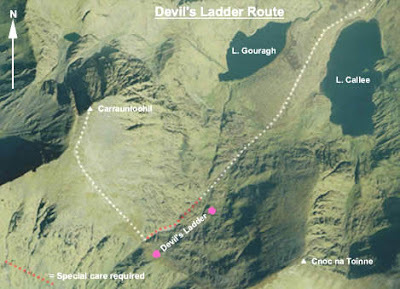 Concerns have been raised about about the current condition of the Devil's Ladder. Recent rains have caused some movement of rocks and scree in the gully and there are a number of significant sized rocks which appear to be a little unstable at present, particularly in the upper section. Extreme caution should therefore be exercised on the Devil's Ladder at the present time. Whilst many people are still using the route safely, some have suggested using alternative routes as a safer option. 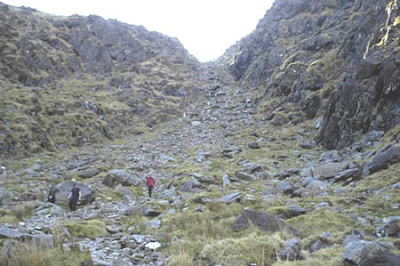 In addition a similar situation exists on the 'Heavenly Gates' track, where a large rock has tumbled to a precarious position at the top of the steepest section of the track at the Heavenly Gates itself. Extreme caution should also be exercised here as it would appear to be only a matter of time before there is further movement and this rock will certainly tumble down the track itself.